The online ad market is poised to grow by $50 billion as advertisers shift their money from offline to online, argues Morgan Stanley analyst Mary Meeker. Below, you can see her charting out why she thinks it's going to happen. She says the time spent on the web is "out of whack" with the amount of money spent on online advertising. 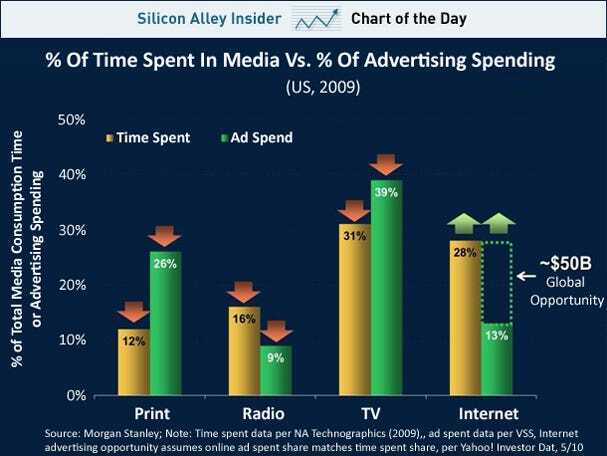 Too much money is spent on print and TV. People spend more and more time online. Soon, the ad dollars will follow people to the web.